Present during the ceremony were (from left) Ray Domingo, operations manager for Building Beaver, Edouard Ferdinand Canlas, president of Building Beaver, Joeben Tai, co-founder and president of Grand Taipan, Robert Niebres, president of Quadstruct, Erika Alexis Garcis, design engineer for Quadstruct, Meriam Bustarga, vice president for operations at YLF, and Ja Lopez, design manager for ASYA. 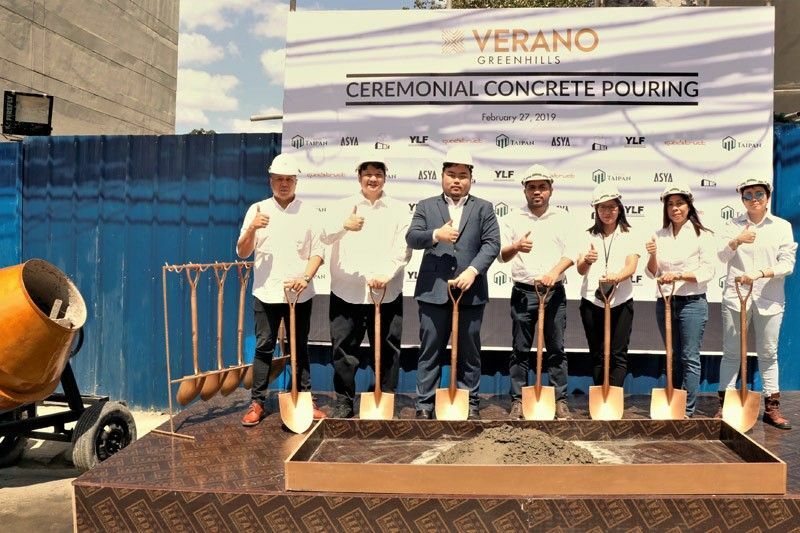 MANILA, Philippines — Verano Greenhills, the first and premiere real estate development of Grand Taipan, held its ceremonial concrete pouring at 9 a.m. on February 27 at Annapolis St. in Greenhills, the site where it will soon rise among San Juan City’s select skyscrapers. Heralding the milestone for Grand Taipan were the company’s executives led by its president and co-founder, Joeben Tai. Joining them in celebration were esteemed guests and partners from Building Beaver Corp., ASYA Design, Quadstruct Inc., and YLF Contracts and Solutions Inc.
“It has always been my lifelong dream to build developments that will provide first-rate quality living. I believe that Verano Greenhills, the first-ever project of Grand Taipan, is just the beginning,” says Tai. Indeed, from being a former real estate broker to becoming the president and co-founder of a real estate company, Tai is turning many of his dreams into reality. Verano Greenhills will offer exclusive residential units and high-end serviced residences that will take up nine floors of the 50-storey condominium tower. Living at Verano Greenhills will be both luxurious and full of fun with its notable amenities and lifestyle features. A bi-level recreation area will house the fitness center, study room, private mini theater, music room, kids play room, and game room. For more rest and recreation, it will have a well-designed swimming pool. There will be a function hall for special occasions and corporate events, as well as a sky deck that gives an amazing view of the city. To complete its offering, Verano Greenhills will provide future homeowners with convenience and comfort. Its location is accessible through transport hubs; proximate to Greenhills Shopping Center and educational institutions like Xavier School, Immaculate Conception Academy, OB Montessori, Poveda and La Salle Greenhills; and nearby government agencies like the POEA. Helping Grand Taipan in the overall construction of Verano Greenhills is Building Beaver Corp., which honed its expertise through numerous and various construction projects. A subsidiary of Hilmarc’s Construction Corp., Building Beaver has proficiently implemented and efficiently completed Joya Lofts and Towers, 8 Rockwell in Makati, and Okada Manila as the General Contractor. Verano Greenhills has been cited by 2018 Property Guru Philippines Property Awards for "Best Condo Architectural Design" and "Highly Commended for Best Condo Interior Design." It is set to be completed in 2022.